Carolyn Jacobs has been a resident of the Township's Point of Woods neighborhood for 46 years. She and her late husband, Eric (who served as Chief of Staff and Township Administrator under the Simons and Platt administrations) have two daughters who are graduates of Cherry Hill High School East. Lisa is a Nurse Practitioner with a specialty in pediatric cardiac critical care and Deborah is a sixth grade math teacher at the Carusi Middle School School. Her professional experience includes programming, project management and account management for INA/CIGNA in Philadelphia followed by nearly 15 years as a consultant to property and casualty insurance organizations throughout the US and the world with a focus on strategy, operations and strategic deployment of computer systems. She retired from IBM in 2011. 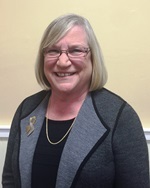 Carolyn was appointed to the Cherry Hill Planning Board in the early 1990's and served on the board, including as Chairwoman, until the travel demands of her career forced her to resign that position. She was again appointed to the Board in 2012, as the Mayor’s representative to the Board. Her additional volunteer activities have included working as a Court Appointed Special Advocate (CASA) for children who have been removed from their homes in cases of neglect or abuse. She is on the board of the BookMates literacy program and continues to read to at-risk youngsters through that program. She is a member of the executive committee of the board of Temple Beth Sholom in Cherry Hill and chairs several committees. She has also served as president of the Ramblewood ladies' golf league.